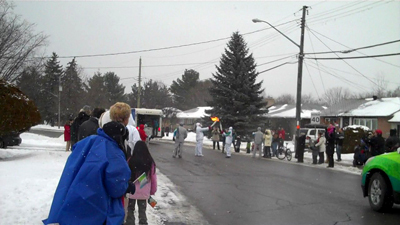 The Olympic Torch was carried through Arnprior today. This first photo was taken on Edey Street, just before the runner turned onto John Street, heading north. Local video producers and volunteers from TVCOGECO were on hand to capture the moments for their local newscasts and possibly for other programmes that may be in the works. We were extremely luckly, as soon as the torch-bearer rounded the corner onto John Street, there was another runner waiting to take the flame from there. The two runners paused long enough to be sure the flame had indeed been transferred successfully and then waited for the cheers to quiet down before the new runner took off on his or her leg of the journey. Beside the torch run itself, there were several other related events in Arnprior today. There was a ‘Fun Run’ (that I almost misstook for the torch arriving here, it would have had to have taken a weird detour to be coming from the west instead of the east) and a Free barbecue at the Shoppers Drug Mart. Downtown streets were blocked off and a stage was set up for a free concert. Stores that are usually closed on a Sunday were open today. I’d like to say a big thank you to all the people of Arnprior for such a big warm welcome as I carried the torch through your community today. And I’ve very happy that people stopped me in the streets to have their photo taken with me and allow me to share my Olympic moment.